Watch Out For That... Plane? A New World's Tallest Water Ride? A Wizarding World in California? Another year bites the dust... can you believe it? I almost can't, but with such an exciting 2012 ahead of us I'm willing to plunge ahead full speed! Before we get there, let's stop on this last day of the year and look back at the year ending. An awful lot happened in 2011, as is true of each year. Instead of trying to recap the whole year I'm going to select a handful of stories from each month from NPN's archives, and editor's choice of sorts. Get in your time machine and let's get going! History has always been an integral park of NewsPlusNotes' focus, and directly along those lines comes January's article. 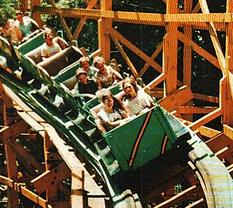 Part of Scott & Carol's Blast From The Past series, this story took a look back at the rise and fall of the Idora Park Wildcat. 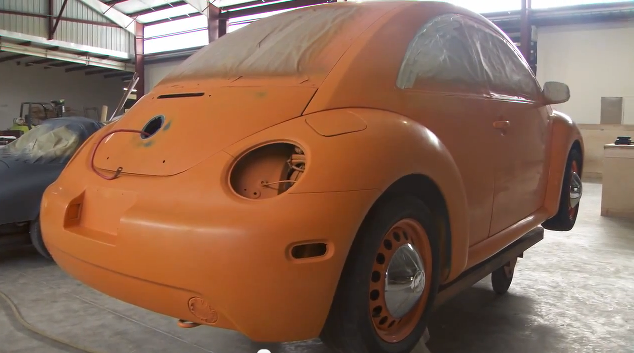 Designed by Herbert Schmeck and built by PTC, the ride is now only a memory - but one we can relive through this story. After many rumors and whispers, February brought the arrival of Invertigo trains from California's Great America to Dorney Park. This went hand in hand with rumors regarding the fate of CGA, which seem to have been resolved as I write this. Now firmly one of my favorite parks around after finally visiting this year, Dollywood opened their new attraction Barnstormer in March, and Scott & Carol were there to check it out. The ride ended up being a nice prelude to next year's mega-attraction, Wild Eagle. One of my favorite months, April, always marks the start of many parks' seasons and also the final test and adjust phase of many new rides. Such was true with the Wooden Warrior, Quassy's medium size wooden coaster. The ride proved to be a hit for the park, and who doesn't love a Gravity Group ride? Not only did NewsPlusNotes hit a million unique visitors in the month of May, but a lot of parks also opened new rides! NPN was there for several of them, including Great Adventure's Green Lantern, Discovery Kingdom's SkyScreamer, Busch Gardens Tampa's Cheetah Hunt, and Wild Adventures' Buzzsaw Falls. Busy month! Sunny June was a good month for taking to the skies at Cedar Fair parks. 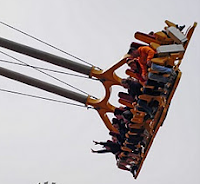 Both Cedar Point, Canada's Wonderland, and Kings Island opened their new WindSeeker family thrill rides this month, though Knott's Berry Farm had to wait a while longer. July isn't a month that most think of Halloween, but the spooky Raven was on Scott & Carol's mind when they featured Holiday World's famous coaster in their Blast series. The column featured a great look at the design of the ride all the way to opening! Plus, visits from NPN to both Coney Island and to see the Zippin Pippin were on the schedule. Even though the Summer wasn't over, it has become a tradition for parks to start announcing new rides in August. This year was no different. Mammoth, Skyrush, Leviathan, and Stinger were just a few of the announcements we saw. And did I mention I finally got to check Dollywood off my bucket list this year? With Summer slowly starting to fade, the rash of park announcements continued into September. One of the most exciting was Wild Eagle, but Six Flags also made one heck of a massive set of announcements as well. I took a long look at Six Flags Over Georgia, and the industry also said goodbye to legend Ron Toomer, who passed away at the age of 81. Halloween has fully infiltrated the amusement industry, forever changing what the month of October holds for fans. This past year we were able to visit several haunts, at each of which we had a good scare or two. The wind picks up and things get a bit chilly in November, but it's also a big construction month. New rides seem to pop up earlier and earlier each year, as seen with both Stinger and Wild Eagle. IAAPA is also held this month, where the industry elite meet and more importantly, buy! Ho, ho, ho, December seems like it just happened, perhaps because it did! Still, our stories continued on through the cold, such as our interview with Rick Bastrup. Universal parks made big announcements on both coasts, with the retirement of Jaws in Florida, and a certain Mr. Potter heading West in a few years time. I'd like to thank all our readers for sticking with us in 2011, and we hope you have a fun and safe New Year's! 2012 is shaping up to be a remarkable year - we'll see you there! Congratulations are in order to Legoland Florida for surviving their first fully packed holiday season in Central Florida - or at least for surviving it so far. The park has, like so many other Orlando area parks, had to close their gate this week (or come just shy) to visitors due to capacity. 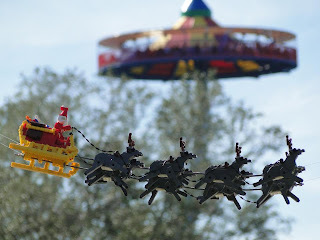 Naturally it sounds like there were a few growing pains for Legoland Florida when the crowds descended, but overall the park handled the masses and now has the experience under their belt. The crowds at Legoland Florida - and other parks again this time of year - continue to bode well for our favorite industry. It's nice, at least for this writer, to see the parks filled to the brim and relevant as ever to the public. For Legoland Florida this is especially true - some had concerns that the park's location would make them a hard sell to the already bustling Orlando market. Still, people have responded to the new park - both area visitors and locals - and in this case they came in droves. With the addition of a water park this summer, Legoland will be able to even better handle the crowds of visitors to the park. If the park continues to be popular I'd bet on even further expansion to add capacity to the park. It'll be interesting to watch the park grow! 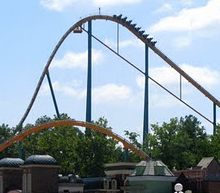 An exciting part of Verbolten's construction has been completed as Busch Gardens Williamsburg has finished the ride's final drop. The coaster will plummet down an 88 foot drop straight toward the park's Rhine River, using the same footers (although quite beefed up) as the Big Bad Wolf. In fact, the nerd in me has been waiting for quite some time to see the completed drop in order to do a comparison shot! Thankfully for us BGWFans has posted some excellent recent photos of the ride, which allowed me to make the comparison above. Verbolten's theming elements for the drop have yet to be put in place, but you can see the footers for them in the photo. It looks like the turns after the drop will be pretty quick, and feature the same fast directional changes that the Wolf did. Looks good! 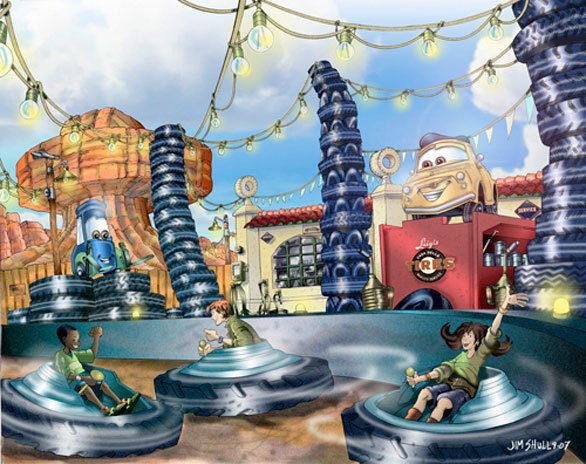 When Cars Land at Disney California Adventure opens next Summer guests will be able to take a spin on the brand new Luigi's Flying Tires attraction. One of three rides in the brand new section, the Flying Tires are really a reincarnation of the Flying Saucers that opened at sister park Disneyland in 1961, though constant problems with the ride forced a short life at the park, only five years. Decades later another ride with cars that hover on air, much like a gigantic air-hockey table, will open again at the Disneyland Resort. In the video above you can see John Lasseter take a test spin on the attraction, and boy those cars can move! It appears as though a lot of fun will be had when the attraction opens. Based on the character Luigi from the movie Cars, guests will first wind their way through the Casa Della Tires shop before boarding. As illustrated in the art, Luigi himself will water over the riders, along with his trusted assistant Guido nearby. Cars Land has a planned Summer opening, and will be one of the year's largest new attractions in North America. 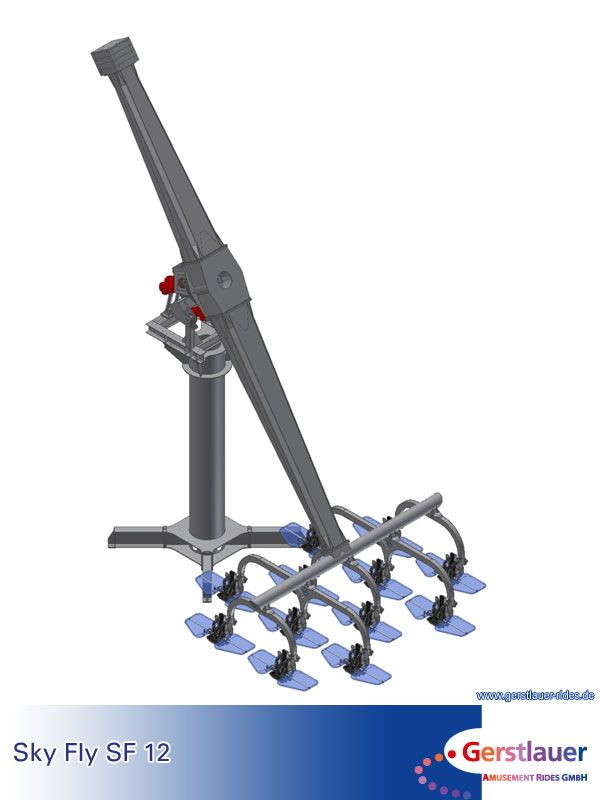 Gerstlauer's latest amusement ride is an interactive one - allowing riders to roll and twist high above the ground in their own independently controlled car. The attraction is named Sky Fly, and it's a more stationary version of the Sky Roller ride the company has already created. The Sky Fly allows twelve riders per cycle to control the movements of their car - including full inversions - as the arm is lifted to 72 feet in the air. Two of the rides will open next year at European parks, Legoland Germany and France's Nigloland. The Ninjago theme, combined with Legoland's usually thorough theming on even the simplest attractions should make for a nice ride. While the rides are quite low on hourly capacity, they make a thrilling and unique attraction for smaller parks. And we may not have to wait too long to try one out in North America. If rumors are true, then Nickelodeon Universe at the Mall of America just may be building one right now. 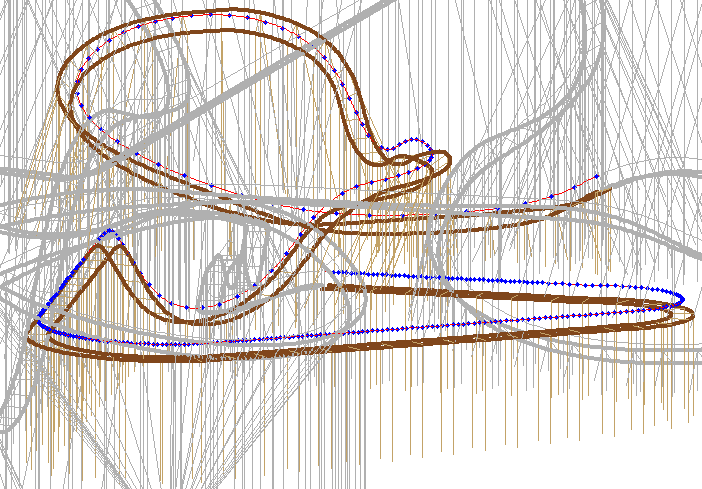 I think it is quite commonplace for fans of our industry to have at times created an extensive collection of scribbles and sketches of rides we've dreamed up. Some of us, however, are talented enough to take those scribbles a step further and create a real design for a ride - and a really good one at that! Looks like fun, right? Travis is a fan of Great Coasters International, as many of you might have guessed after studying that layout. His design utilizes many of GCI's common design elements, wrapped together in a way that is uniquely his own. The project was created near the end of Travis' education in engineering, making the design contain more real components than any doodle I've ever dreamed of. With any luck one day we will be able to take a spin on one of Mr. Rothbloom's creations, but as for now I have to thank him for sharing his dream with us. 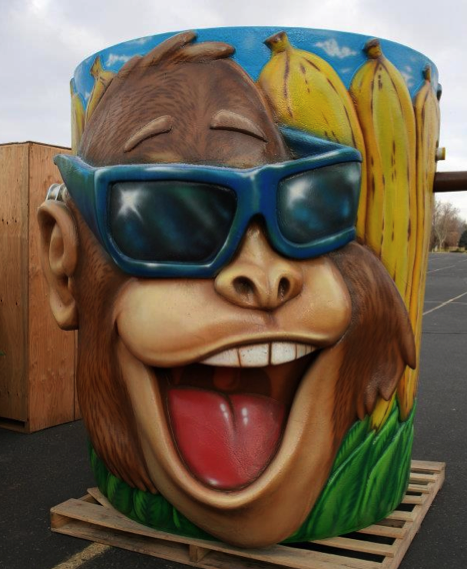 Cliff's Amusement Park is a New Mexico family tradition, and one that's going to be bigger and wetter than ever next season. The family owned and operated park has some major construction currently going on, needed in order to greatly expand the park's water area next year. The work site is so big that two rides have had to be moved, and one permanently retired. Both the park's Sea Dragon and Cliff Hanger (free fall ride) are being moved to new homes inside the park. Another ride, the Rock-o-Plane will be retired. The park's existing Water Monkeys' Adventure, a small water play area, has also been dismantled. All this work is for the park's new Cliff's Water Adventure area, though full details have not been disclosed yet. Some hints are being made pretty clear, though, such as the above photo of a giant monkey themed tipping bucket, which was recently delivered to the park. 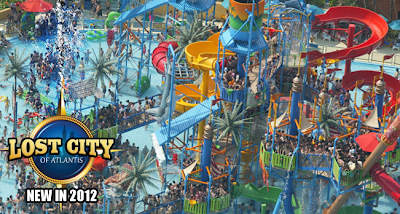 In other shared photos, pieces of what looks like it might be a much larger version of a water fortress have arrived, complete with large slide pieces and other monkey theme elements. It sounds like Cliff's is getting ready to make a full announcement, we'll be sure to check up on that when the do! It's been quite some time since I've had a chance to update with NPN. I've been performing onboard Norwegian Cruise Lines for the past couple months, traveling all around the Caribbean. Tough life, I know. 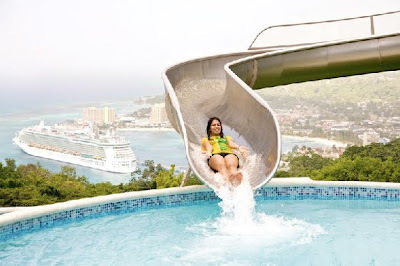 Our ship (the Norwegian Pearl) would dock weekly in Ocho Rios, Jamaica, home to the popular Dunn's River Falls. 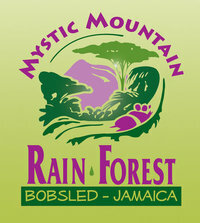 The town is also home to Mystic Mountain, an exciting mountain-top entertainment complex accessible only by chair-lift. 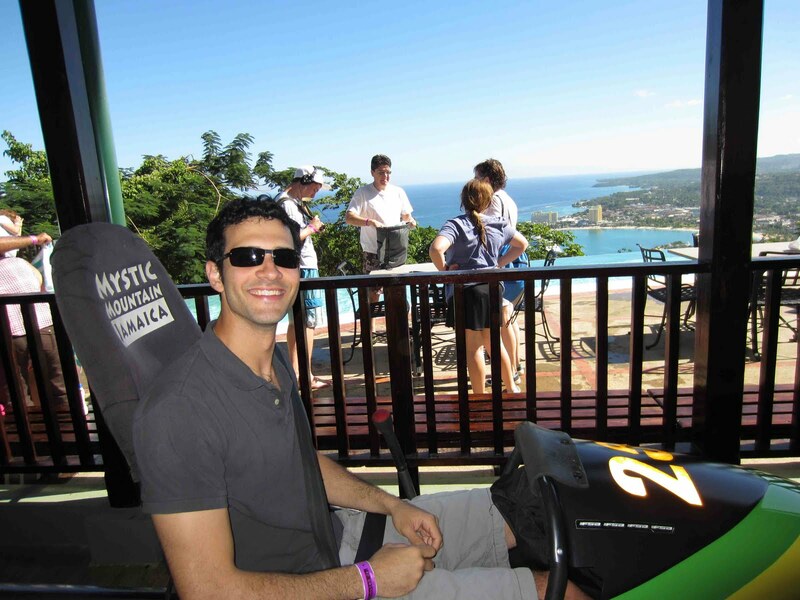 At the peak, guests can tackle zip-lines, a giant waterslide, and a summer bobsled that could certainly be considered a thrilling roller coaster experience. Needless to say, I had to check it out! 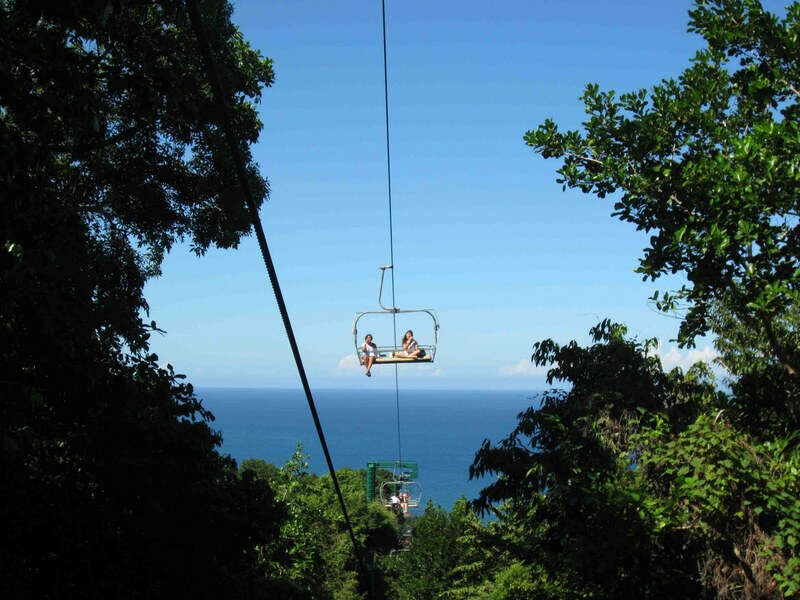 The ride up the mountain provides a stunning view of the Caribbean Sea, as well as some close encounters with gorgeous giant spiders in the canopy of trees surrounding the lift. Check out the on-ride video of the bobsled! Your NPN contributor pictured above, ready to ride! The park's waterslide is surprisingly long and fast, and arguably has one of the most impressive views from the top. It's easy to spend an entire day at Mystic Mountain, and I would strongly suggest making this attraction a top priority. Many Caribbean-bound cruise lines dock in or nearby Ocho Rios. Check out the park's website here. The time has just about come for Richard Kinzel's time at Cedar Fair to come to an end. His career spans almost 40 years with the company, seeing it grow from a two park operation to the large amusement park operator it currently is. The Toledo Blade has run a nice piece on the outgoing leader, looking back at his entire career. There's some interesting tidbits in the story as well, such as the fact that several companies at one time or another looked to purchase Cedar Fair including Taft Broadcasting (Kings Island, Kings Dominion, Canada's Wonderland), Marriott (both Great Americas), and even Anheuser-Busch. Imagine the "what-ifs" if those sales had gone though! This is definitely a must read for any fan of the company. Head over to the Toledo Blade and check it out. Legoland Billund will be premiering a new coaster next year, aptly named the Polar X-plorer. The Zierer family ride will feature a dropping track section, as well as some nice theming and even a trip past some live penguins! The park has loaded (albeit a tad rough) a new point of view movie to their Facebook account, which shows off the layout of the ride. For a family attraction you'll hear no complaints from me, the ride looks like solid fun. The climax will be when the train enters the snowy mountain, only to skid on some ice and break through, falling abruptly downward. No worries, though, as the train stops smoothly, takes a few turns, and then guests can wave hello to the penguins as they meander by. Check out the movie at this link. Happy Holidays everyone! Best wishes to you and yours from all of us here at NPN! For a long time Bing was the only option for great bird's eye view images of parks, but now Google is moving in with their new 45 degree images. One of the first parts of the country to have the images added (there are more now, but we'll explore those later) was the West coast. While we've seen most of these parks in previous Aerial Antics' columns before, the new images do show some recent California parks updates. Six Flags Magic Mountain's crisp imagery contains shots of recent attractions like the one above, of Apocalypse. The Green Lantern, however, is not added yet. Invertigo at California's Great America may be Inverti-gone at this point (and suddenly practically in my backyard!) but you can still check it out in its original location. 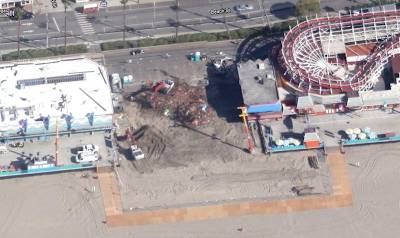 Work was well underway at the Santa Cruz Beach Boardwalk on their new Ghost Castle building when these photos were taken. 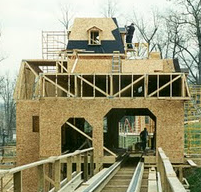 The work seen above eventually turned into a huge hole, then eventually a two story dark ride! 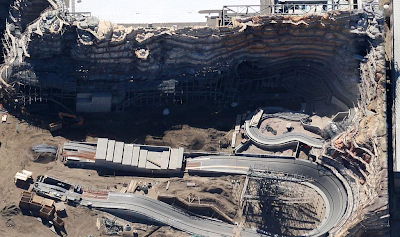 Paint was just starting to be applied on the face of the massive rock work under construction at Disney California Adventure for Cars Land. It's pretty neat to zoom around and see all different projects underway at the same time! Lots of nice California sunshine lets us see plenty of details at Knott's Berry Farm, such as one of their recent coaster additions, Sierra Sidewinder. 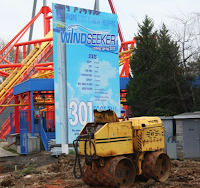 No WindSeeker in these images, though. 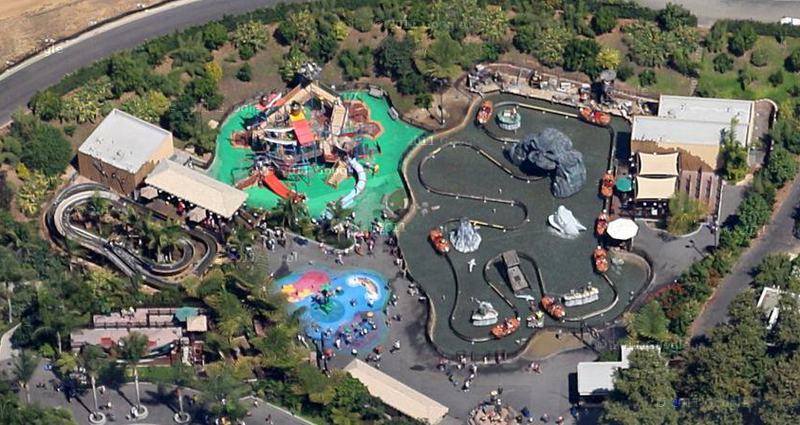 The last time we checked out Legoland California's new Pirate themed area from the air it was still under construction, but in newer photos we see the section fully open. The water park they just opened didn't quite make the cut yet, though! We'll be back on Monday, until then have a happy and safe holiday! 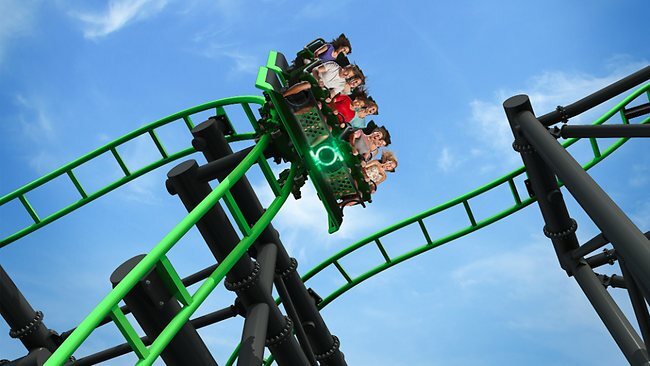 The coaster with the steepest drop on the Southern hemisphere has officially opened at Warner Brothers Movie World on Australia's Gold Coast. The new coaster, named the Green Lantern, features a 120 degree first drop, which is well beyond vertical. Only one coaster in the world features a steeper drop, Takabisha at Fuji-Q Highland, which features a 121 degree plunge. The coaster is the 4th instillation of S&S Worldwide's El Loco model. A significant change to the ride was made with the debut of new cars, which Scott & Carol featured a photo of in NPN's recent IAAPA coverage. The cars now have only lap restraints, which should improve the ride experience tremendously. The Green Lantern's cars also feature on-board audio, as we've seen with several other comic book themed rides around the world. 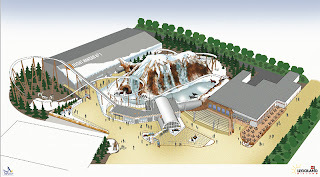 Yesterday we saw a great example of an outdoor water park expanding for next year with Mt. Olympus' news, but that doesn't mean that things have become stagnant for indoor parks. The 11 year old Kalahari Resort in the Wisconsin Dells just opened a brand new slide tower as a part of an expansion of their offerings. 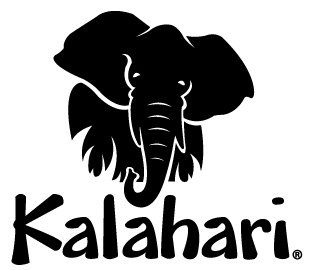 The indoor water park resort is one of two under the Kalahari name, with the other being located in Sandusky, Ohio. The new tower, which actually features two different attractions, is named Tufani Falls. It contain a pair of slides named the Sahara Sidewinders and another named the Screaming Hyena. The Sahara Sidewinders are a pair of dueling water slides that perform a horizontal loop as they plummet to the ground below. 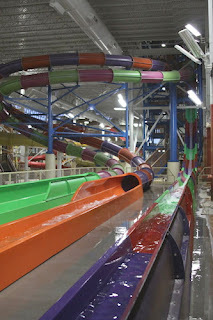 The slides start at 60 feet in the air, which actually required Kalahari to go above the existing roof of the park! The Screaming Hyena is a vertical plunge slide, aimed at thrill seeking visitors. The 65 foot plunge sends riders down at 25 miler per hour to the splash out at the bottom. The hotel's lobby also received a brand new floor mural during the renovation, and a new kid play area was added to the water park. For more photos of the new attractions, click here. 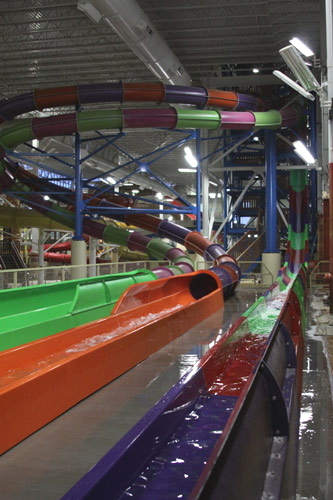 Continuing the trend of water park expansions we're seeing across the country, Mt. Olympus Water & Theme Park has announced a gigantic new play structure as next year's addition. The $4 million addition will be known as the Lost City of Atlantis, and will stand an impressive six stories tall and feature seven different attached water slides. Provided by WhiteWater West, the structure will be a Giant RainFortress, more on the scale of Hersheypark's East Coast Waterworks than previous smaller versions. The Lost City of Atlantis, in addition to the slides, will also have a massive tipping bucket along with a geyser that shoots water over 120 feet in the air. Plenty of family friendly slides will also be a part of the Lost City. 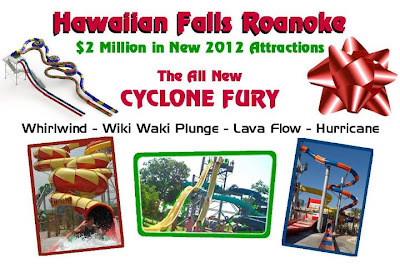 There will be several smaller kiddie slides, but also a large family raft ride. Thrill seekers can take a spin in the champagne bowl slide, or the whole gang can drop down into the family Boomerango. The new development will cover 3 acres at the park when complete. Here is an early Holiday present for everyone, especially those fond of rides that are currently resting in pieces. 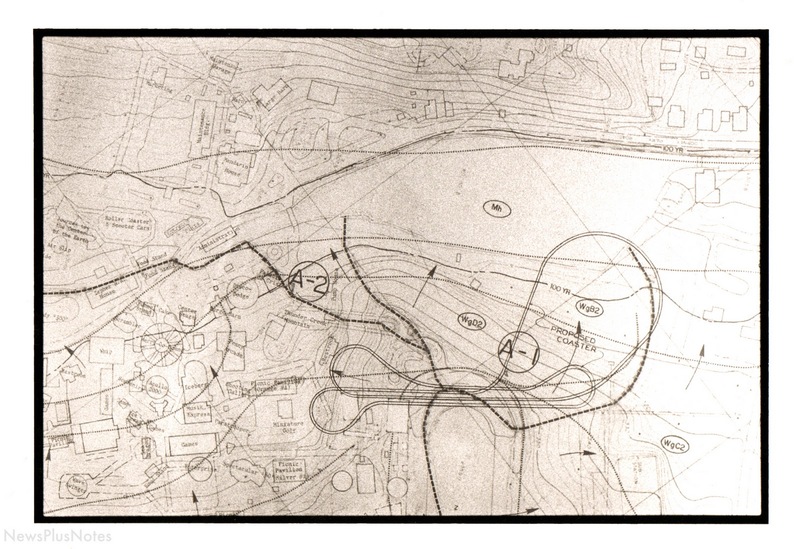 This is a copy of the plans that were used back in July of 1988 when Dorney Park was attempting to gain approval of their massive new wooden roller coaster, eventually named Hercules. Along with the layout of the coaster this serves as a nice snapshot at the park at the time. Click the larger version to see all the other rides named on there - Miniature Golf, the Spectacular, Iceberg, Penny Arcade, Merry-Go-Round, Journey to the Center of the Earth, and more are listed. 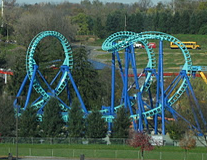 Several other rides are in locations that that have since changed. 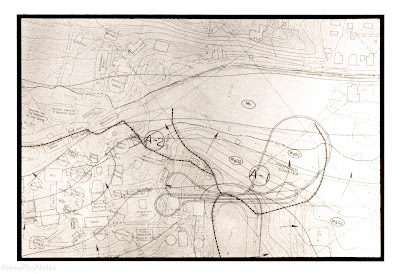 The layout of Hercules is placed over the park as it was at the time, you can see that the station area for the coaster sat pretty directly over one of the racetrack's turns. 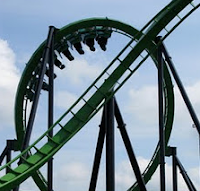 The coaster may not have stood the test of time, but it's hard to argue that it didn't help propel Dorney Park to a 'next level' in its development. For more on Hercules, check out two different stories that NPN has run on the ride over the years. This is what you get for not paying attention to a ride's construction - sometimes even after the track is complete some big surprises remain! 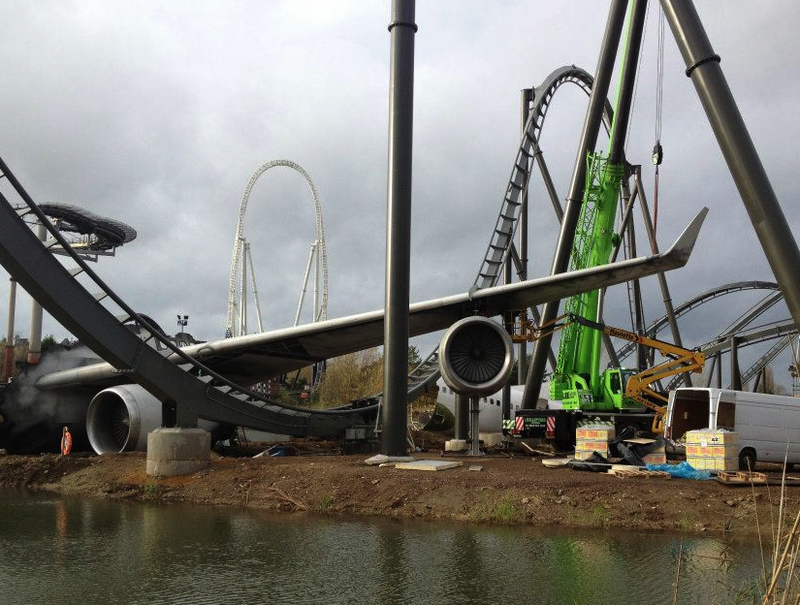 In this case that big surprise comes in the form of a massive faux plane that's been added to Thrope Park's new Swarm coaster. If you look closely at the track as it dives under the wing you can see how close of a fit that's going to be. 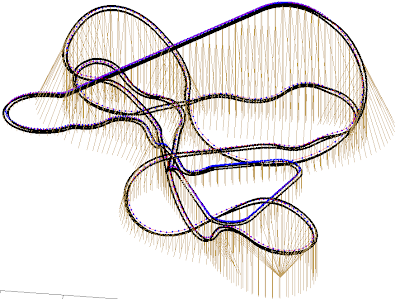 Keep in mind that the trains on Bolliger and Mabillard Wing coasters are huge, making that close call even closer. More photos of this impressive set piece can be seen here. ...no punch-backs! Visitors to Busch Gardens Williamsburg's Christmas Town were able to get a treat on their mobile devices in the form of a QR code that links to a brand new Verbolten movie. This time around the construction of the ride is not being shown off, though it seems that the ride has progressed much in recent weeks. Instead this movie focuses on the theme and story of the ride. 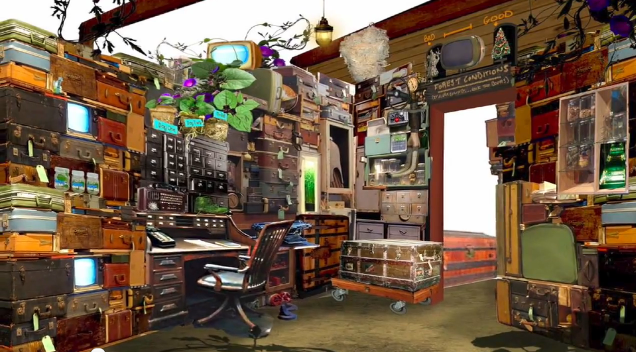 The movie features some new concept art of the ride's queue area, which will have a bit of a cluttered feel if the above art holds true. There's also a look at some of the cool props being fabricated for the ride. You can check out the video at this link. 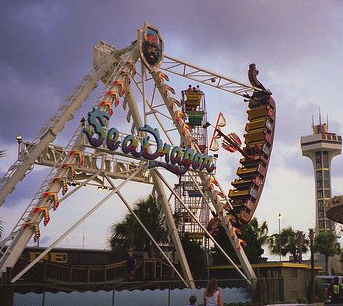 The new Miracle Strip amusement park has announced a new ride addition, the Sea Dragon. The ride will be part of other expansions in 2012, I love to see this little park growing! 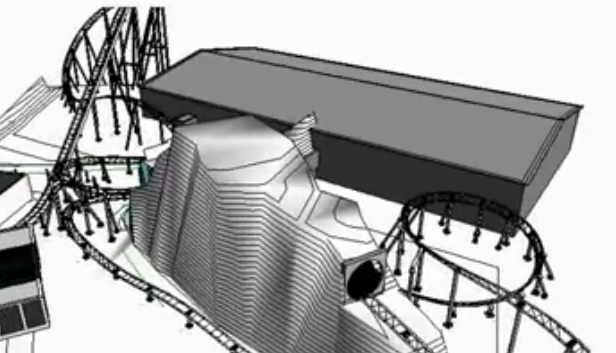 We can put the rumors of Mirabilandia's new DiVertical ride having a coaster section to bed - indeed it will. Supports are now up for the start of a hill after the big drop. Going, going, gone. Same week as Kennywood announced a new ride, the Pitt Fall removal was just about completed. Check out some recent photos. 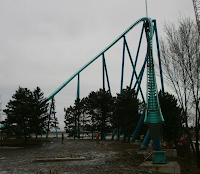 The construction of Leviathan at Canada's Wonderland continues on, with the park recently completing both the ride's first huge turn, as well as plenty of track on the ride's out run. I do believe that Europa Park's new GCI wooden coaster, recently named Wodan Timbur Coaster, feels like it's been the fastest I've seen in a while! Almost all of the ride's twists and turns are up. 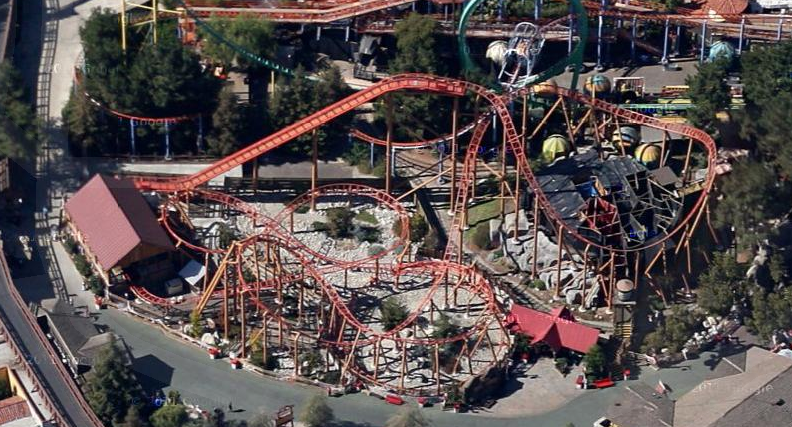 Six Flags and candy-maker Mars is a match made in heaven, or at least the companies think so. Mars' sponsorship has been renewed for another three years, and will be expanded at all parks. While putting up a 301 foot thrill ride is a challenge, so is building the massive footings for such a structure. 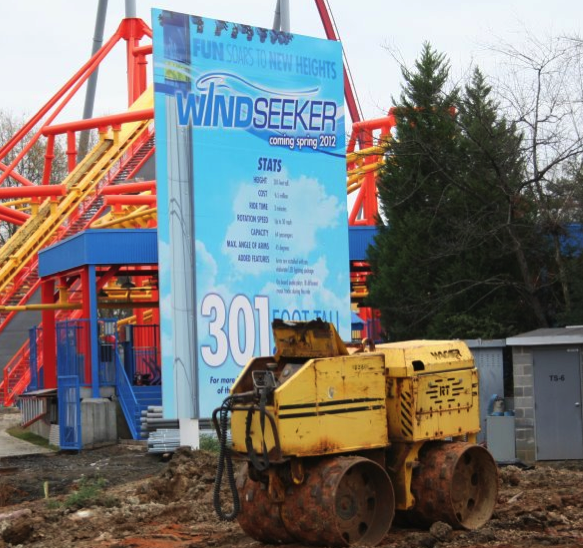 Carowinds looks to have just completed exactly that, based on these new photos. No more thorn in Cedar Fair's side? Q Investments has announced that they will shed up to a third of their shares of the company. So long as the unit price stays up, of course. This article details some of the real challenges going into choosing a project for the site of the former Six Flags New Orleans theme park. Sounds like a park could reopen there, but I'm not holding my breath. 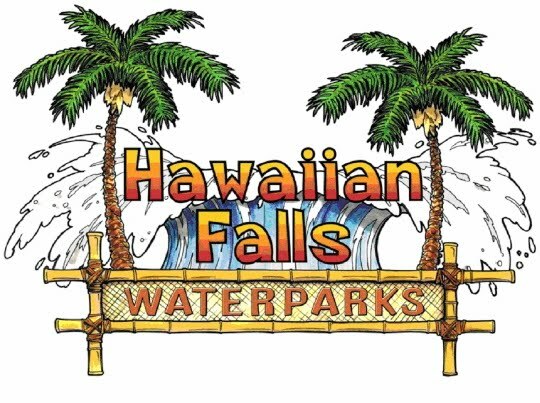 Even after a 2011 that saw plenty of expansion, including the addition of some unique torpedo tube slides, the four Hawaiian Falls water parks in Texas will be greatly expanding again in 2012. Each park will receive new attractions that fit the demand of that specific park, ranging from wild thrill rides to children's play areas. These expansions were announced even as the chain is working on opening a 5th Hawaiian Falls park next year, a $10 million park located in Waco. The parks put together a nice graphic for each park, so let's check out what is being added. The Roanoke park will spend almost $2 million on a new slide tower named Cyclone Fury. 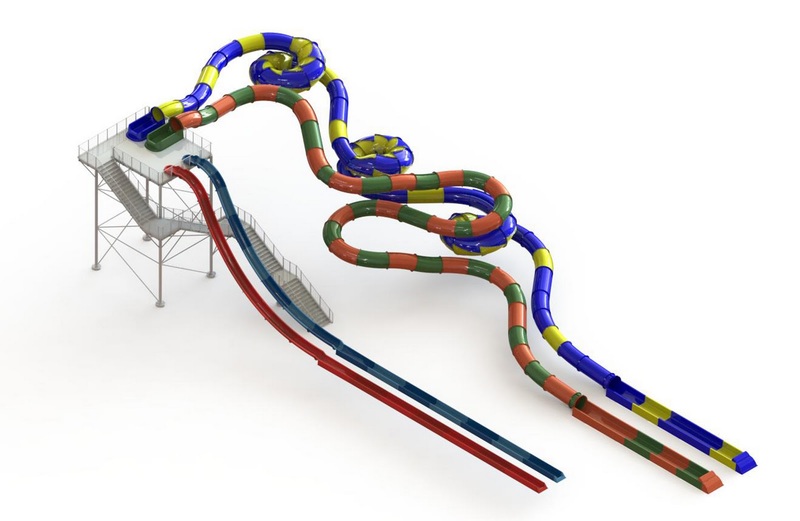 It will contain four slides, including two speed slides next to each other, a family raft ride, and one of Whitewater's "constrictor" slides, which have the tightest turns in the industry. The constrictor type slide is a new design, and will be one of only a handful in the country. 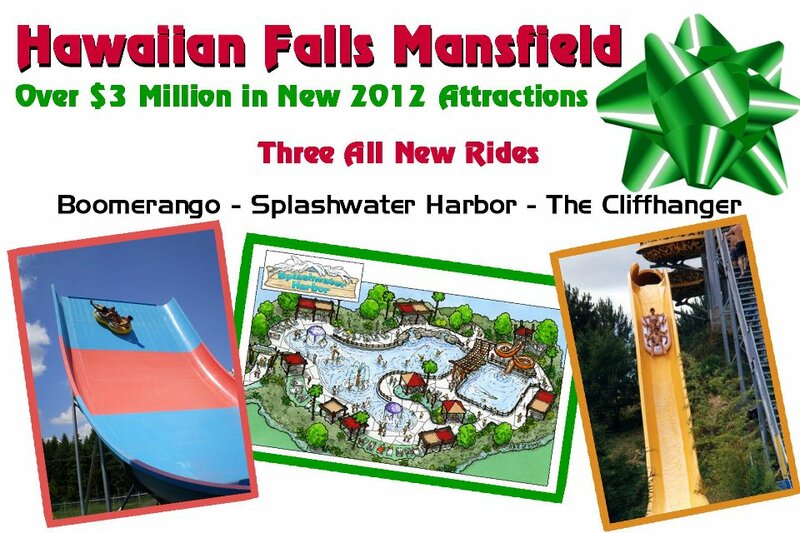 Mansfield will feature a selection of rides for the whole family as part of their $3 million in additions. A Boomerango slide will be added, along with the Cliffhanger, which has a 40 foot drop. Splashwater Harbor will be a 10,000 square foot children's play area. The park located in Garland will see the retrofit of two existing attractions into new experiences. 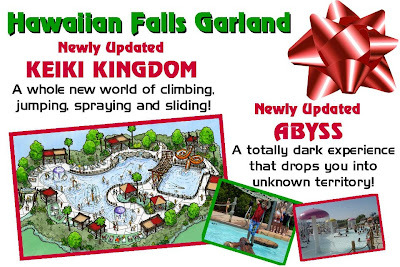 The Abyss will be a totally dark slide that will feature lights, sounds and projects to enhance the experience. The park's children's area will be expanded and turned into Keiki Kingdom, a play area aimed at kids. 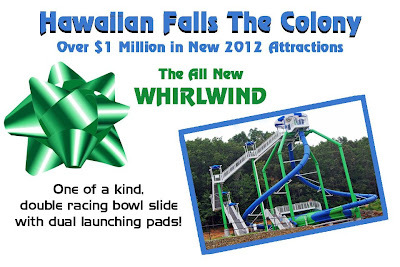 Finally the park located in The Colony will add the new Whirlwind, a unique double bowl slide that we recently saw announced for Fun Spot's expansion in Orlando. Two slides funnel into the same bowl creating a crazy racing experience. Details on all the parks can be found on their official websites. 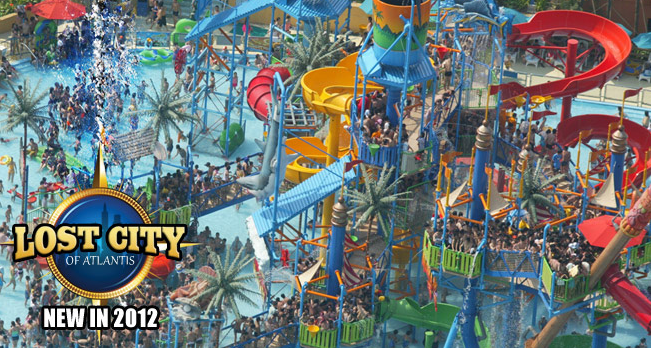 This chain certainly is keeping water park manufacturers happy these days!